Haylie Duff and The Walking Dead's Alanna Masterson make an easy Tom Yum Soup. Pour stock into a pot and bring to boil. Cut lemongrass into 4 pieces, smash to release flavor, then add to pot for 2-3 minutes. Add minced garlic, lime leaves and mushrooms. Reduce heat to medium and simmer for 5 minutes. 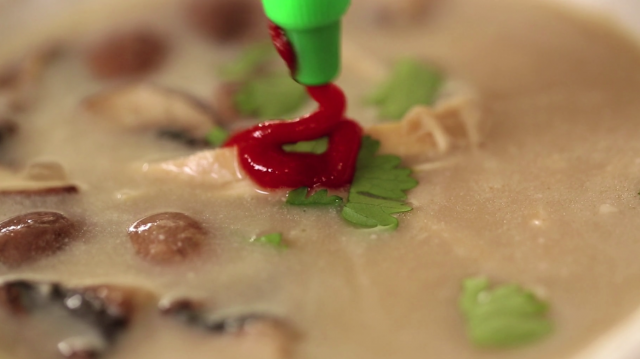 Reduce heat to medium-low and add coconut milk, fish sauce, and lime juice. Stir well to combine and gently simmer until hot. Remove and discard pieces of lemon grass and ginger. Shred chicken and add to soup. Ladle into serving bowls and top with fresh cilantro.